The TC200-EX Battery Charger from Dolgin Engineering features integrated battery plates that support Sony and third-party BP-U30, BP-U60, and BP-U90 batteries. These batteries are used with Sony's PXW-FS7, PMW-EX1, PMW-EX3, PMW-100, PMW-200, and PMW-300 cameras. The TC200 has semi-independent channels and allocates more power to the battery that needs it the most first. Once battery levels are equal it charges both batteries simultaneously with equal power distribution. The result is that all batteries will be ready at the same time. This particular model will charge a single or two BP-U60 batteries in approximately 4 hours. The charger comes with a U.S. power cord and supports worldwide power input via optional plug adapters. Box Dimensions (LxWxH) 9.65 x 7.0 x 3.0"
TC200 Two-Position Simultaneous Battery Charger for Sony BP-U30, BP-U60, BP-U90 is rated 4.0 out of 5 by 5. Rated 2 out of 5 by Anonymous from Failed after 6 months The left station failed after 6 months. Lights stopped working and batteries no longer charge in that station. Looks well made. Metal based, plastic ports. I took it apart to see if a solder joint had failed, but the motherboard looked crystal clear. Two of the screws stripped when putting it back together. Rated 5 out of 5 by Christopher from Well built, solid charger Metal base is solid, but not too heavy. Batteries easily slide and lock into place on the charger. Two simple LEDs show if it's charging or finished. Use it with my Sony and SWIT BP-U batteries. I will definitely consider more Dolgin products in the future. Rated 4 out of 5 by Chuck B from Charger works We just purchased a Sony EX1r and have several batteries. 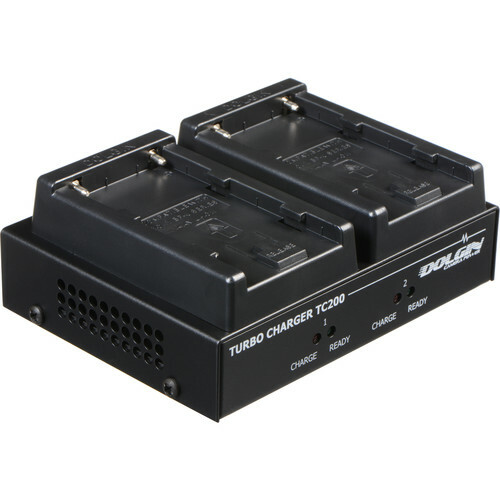 We ordered the TC200 EX Battery charger and plugged in two BP 60 Sony batteries. A series of colored lights let you know the status. It's simple, fast, and it works. Thanks. Rated 5 out of 5 by Thad from Great customer service After my original unit failed (left port), Dolgin repaired it for free. They are very responsive and helpful. It's clear they want to create a high quality product as they monitor reviews to find and solve any issues. Hi,Will this charge BPU90s also? I know we have different size/brand batteries that charge on this. If the battery fits on an EX/PMW-300 this thing should have no problem charging it from my experience. Hope this helps.